Kate Vaughan is no stranger to tough choices. She's made them before. Now it's time to do it again. Kate has a secret, something tucked away in her past. And she's getting on with her life. Her business is thriving. She has a strong relationship with her family, and a devoted boyfriend whom she wants to love with all her heart. If Kate had ever made a list, Rowan would fill the imagined boxes of a perfect mate. But she wants more than the perfect-on-paper relationship; she wants a real and imperfect love. That's why, when Kate discovers the small velvet box hidden in Rowan's drawer, she panics. It always happens this way. Just when Kate thinks she can love, just when she believes she can conquer her fear, she's filled with dread. And she wants more than anything to make this feeling go away. But how? When the mistakes have been made and the running is over, it's time to face the truth. Kate knows this. She understands that a woman can never undo what can never be undone. Yet for the first time in her life she also knows that she won't fully love until she confronts those from her past. It's time to act. Can she do it? Can she travel to the place where it all began, to the one who shares her secret? Can the lost ever become found? 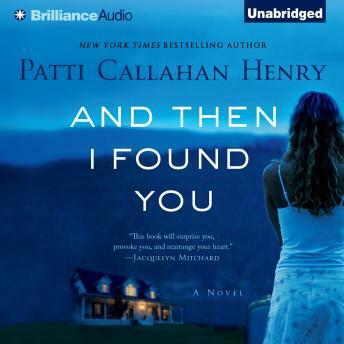 And Then I Found You gives new life to the phrase "inspired by a true story." By traveling back to a painful time in her own family's history, the author explores the limits of courage, and the price of a selfless act.